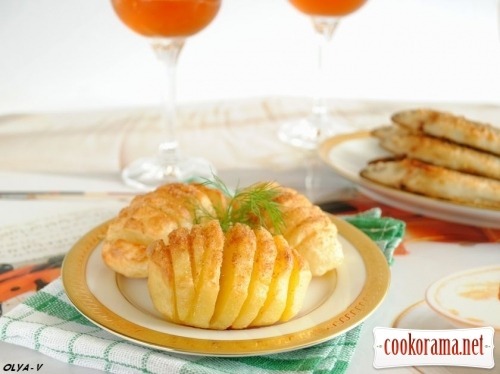 The recipe is taken from site «Women club of Olga Taevskaya». Heat the oven at 225℃, cover baking sheet with foil. Peel potatoes, wash and dry. Then cut into thin slices, cutting not till the end. Spread potatoes on baking sheet, pour oil, do not salt, put in the oven at 25 min. Then remove from oven, salt, pour with oil again and sprinkle some rusks, you can use dried garlic and spices. Put in the oven for another 20 min, till potatoes become brown. Serve it hot, Bon Appetite! Top of recipe "Potatoes in Swedish style"
Смачно і просто. А як апетитно виглядає.